Most teeth that have had root canal therapy, with proper care, can last as long as other natural teeth. Sometimes a tooth that has had root canal treatment fails to heal. This tooth can become painful or diseased months to years after the initial treatment. If this sounds like your tooth, endodontics or root canal therapy may be able to save your tooth. Tiny or curved canals untreated during the initial root canal treatment. Complicated root canal anatomy was not detected during the first root canal treatment. The placing of a crown or restoration was not done in a timely fashion. 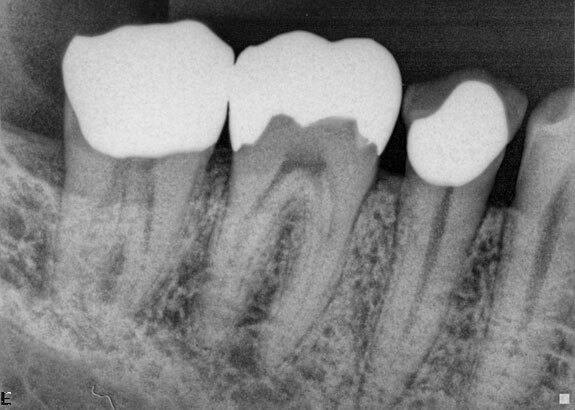 Salivary contamination occurred in spite of the crown or restoration/filling. While most teeth needing root canal treatment will heal with routine endodontic treatment, in some instances a minor surgical procedure is needed to help clear-up an infection or other problem related to a tooth that has previously had a root canal. This procedure is commonly done in the comfort of our office with the use of a surgical operating microscope and other state-of-the-art equipment to ensure the best chance of healing and retention of the tooth. There are five general categories of cracked teeth. The treatment and outcome depends upon the kind, location, and depth of the crack. It is important to have early diagnosis because the cracks can extend and deepen over time, sometimes resulting in the loss of the tooth. We have successfully treated hundreds of cracked teeth and are able to save most of them, especially the ones that were diagnosed early. We use microscopes, stains and fiberoptic lights to help us detect and treat cracks that are many times undetected. Dental trauma is injury to the mouth, including teeth, lips, gums, tongue, and jawbones. The most common dental trauma is a broken or knocked out tooth. We primarily treat displaced, loosened, or knocked out teeth. Most traumatic injuries occur in children although anyone can have trauma to their teeth. The treatment is determined by the severity and classification of the injury and can range from simply monitoring the traumatized teeth over time to repositioning or reimplanting loose or knocked-out teeth. Many traumatic injuries injure the pulp of the tooth. When the pulp becomes injured or inflamed from the trauma, root canal treatment may be necessary. Root canal treatment is a great way to eliminate a tooth ache and at the same time, save the tooth! We use digital x-rays to reduce radiation to our patients! We also use digital x-rays to enhance our treatment and to provide easy viewing for our patients. We use four operating microscopes, one in each treatment room, that give us outstanding visualization of your tiny root canal.